A truly special setting for your exchange of vows. 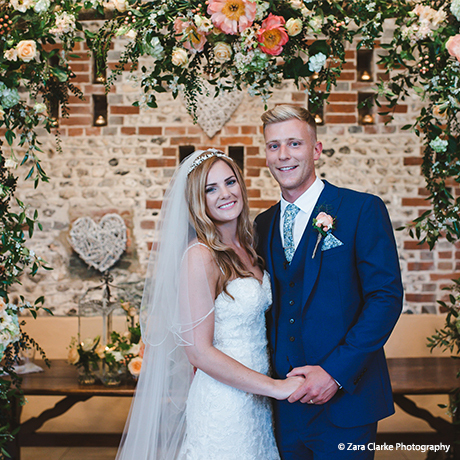 Civil ceremonies at Upwaltham Barns take place in the East Barn. With floor to ceiling windows and the greenery of the South Downs in the background. On the day of your wedding, you may like to get ready in Jasmine Cottage (and peek at your guests arriving from the windows or balcony without being seen!). Once your guests have assembled, cross the courtyard to the East Barn and make your grand entrance. If you are arriving in your wedding car, you may enter through the archway that leads you into the courtyard. The warm, rustic barn is instantly romantic and the perfect setting to say “I do”. You have the option to get ready in Jasmine Cottage before your ceremony. There are different layouts possible for your ceremony. Chairs and a registrar’s table are included for your ceremony.